A photo illustration of the digital Cryptocurrency, Bitcoin, is seen on September 13 2018 in Hong Kong, Hong Kong. The world’s largest cryptocurrency dropped to its lowest level in more than a year on Monday. 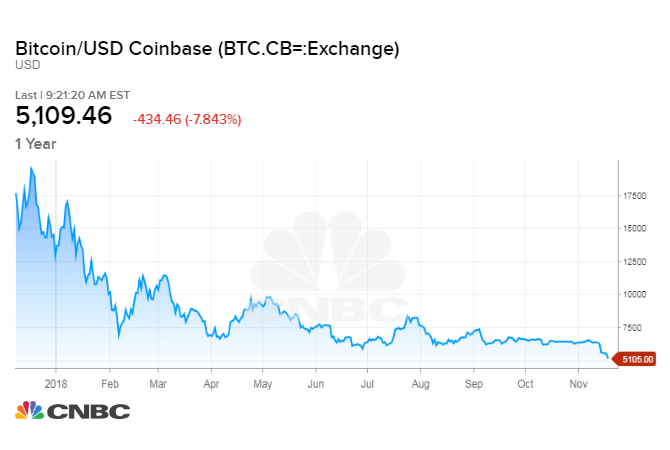 Bitcoin hit a low of $4,951.47, bringing its losses to more than 21 percent in the past seven days and more than 62 percent this year, according to data from CoinDesk. The digital currency began stumbling last week after months of relative calm. Bitcoin had been trading in the $6,400 range, a break from its volatility earlier this year, for the majority of October as the rest of global markets sold off. The cryptocurrency is now down more than 30 percent since last Thanksgiving. Its epic rise started right after the American holiday last year, as the cryptocurrency gained its status as a household name and became a common topic around dinner tables. Bitcoin first topped $10,000 at the end of November last year and was worth almost $20,000 ahead of Christmas, mostly driven by retail investors. The rapid run-up also coincided with the introduction of a bitcoin futures market in December. Peak prices lined up with the day the Chicago Mercantile Exchange, or CME, introduced bitcoin futures trading on Dec. 17. The Chicago Board Options exchange, or CBOE, opened a futures market a week earlier. Until futures existed it was extremely difficult, if not impossible, to bet on the decline of bitcoin prices. On Monday, both of those bitcoin futures hit their lowest level since they were introduced. Bitcoin CME futures fell as low as $5,015 while bitcoin contracts on the CBOE dropped to $4,990. Other major cryptocurrencies were mostly lower this week and have fared even worse than bitcoin this year. XRP, the second largest by market capitalization, fell 5 percent Monday while ether dropped more than 13 percent, according to data from CoinMarketCap.com. Roughly $40 billion has been wiped off the entire cryptocurrency market capitalization in the past week, and was around $172 billion Monday. Analysts attributed bitcoin’s continued sell-off to technical levels and stop orders in the market kicking in after bitcoin fell below $6,000. Others pointed to a split in the cryptocurrency bitcoin cash. That digital currency split into two versions last week — “Bitcoin ABC” and “Bitcoin SV” — which analysts said added to uncertainty in broader crypto markets. U.S. regulators made good on promises to regulate non-compliant cryptocurrency projects last week. The Securities and Exchange Commission announced its first civil penalties against crypto founders Friday as part of a bigger regulatory and legal crackdown aimed at abuses and outright fraud in the growing digital currency industry. The cryptocurrency tumble also comes after fresh warnings from European Central Bank Executive Board member Benoit Coeure last week, according to a report from Bloomberg News. Coeure called bitcoin “a combination of a bubble, a Ponzi scheme, and an environmental disaster,” at a Bank International Settlements in Basel. This entry was posted in Bitcoin, Cryptocurrency. Bookmark the permalink.